Last month, during the dark days of January we got extremely excited to announce a special save the date feature. Little Cavalier festival announced it’s return for THE biggest bank holiday festival taking place in May. 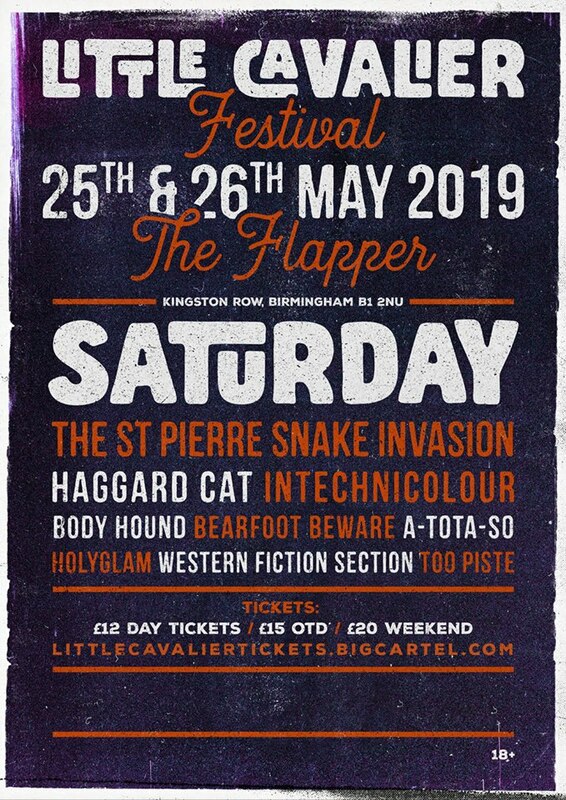 Our friends and incredible promoters Little Cavalier are returning back to The Flapper in Birmingham to host an unmissable weekend of music and mayhem. Last year they held their first ever Little Cavalier Festival at the Flapper, Birmingham. The announcement in 2018 came as the prestigious and iconic venue was in the spotlight for being under threat of closure by owners of the building due to redevelopment plans. Little Cavalier continues to host their events at this much-needed venue in hope to maintain awareness to the legendary establishment The Flapper. The festival is set to return during the last May weekend. 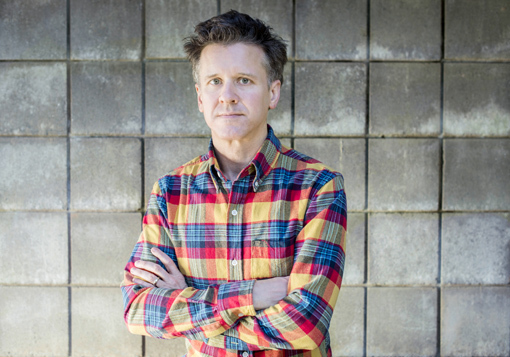 Ahead of the weekend, we spent some time chatting to Rich of Little Cavalier to discover more about the hard work gone into planning this weekend, keeping headliners a secret, why the Flapper means so much to LC and why you should get your tickets now…. ● Firstly thank you for spending time with Circuit Sweet. No problem! Always a pleasure! ● We want to know the ins and outs of this now somewhat legendary little festival- so before we get to find out more. Introduce yourself and your role with Little Cavalier? I’m Rich, one of the founders of Little Cavalier, a Birmingham based Live Music Promotion group, specialising in left-field math/alt/noise rock. ● The festival is now, respectfully in it’s 2nd year, but casting back to 2018 the first year-how did the festival come about and how has it since evolved through the last 12 months? down! This year we’ve upped everything and I’m super excited for everyone to have an amazing time. We’ve gotten closer to loads of bands so filling the line up was a pleasure everyone on the festival is our friends! ● What’s Little Cavaliers’ main goal for everyone? We just want to expose people to as much amazing music as possible and give bands the opportunity to play! We’re all musicians in our own right and love that we can do that for others. We love supporting local businesses and creating a big community of like-minded individuals. ● How would you describe what this treasure provides over the course of 2 days, what makes this experience so special? were top of my list to get for Sunday so I’m super happy about that too. There are loads of amazing venue festivals happening in 2019, Portals in London, PWER Festival in Cardiff and of course Strangeforms up in Leeds, we are lucky to be in amongst great company. ● The line-up over the weekend boasts a variety of incredible original acts from across the UK- you’ve curated a truly exceptional plethora of talent to hear and see- how did the line-up come about? Basically I just book bands I want to see haha! All of our “One-off” shows start with a big list of bands we want to book, and we just fill up a dream line up. I’ve been very lucky to have such a great relationship with lots of the bands on the bill this year, the UK has some of the best bands and getting them on Little Cavalier 2019 is something I’m really proud of! ● What’s the process in finding the right headline act for this year’s monumental event? Basically I’ve been bugging Damien (frontman of The St Pierre Snake Invasion) for about 12 months to get them to play a show for me! 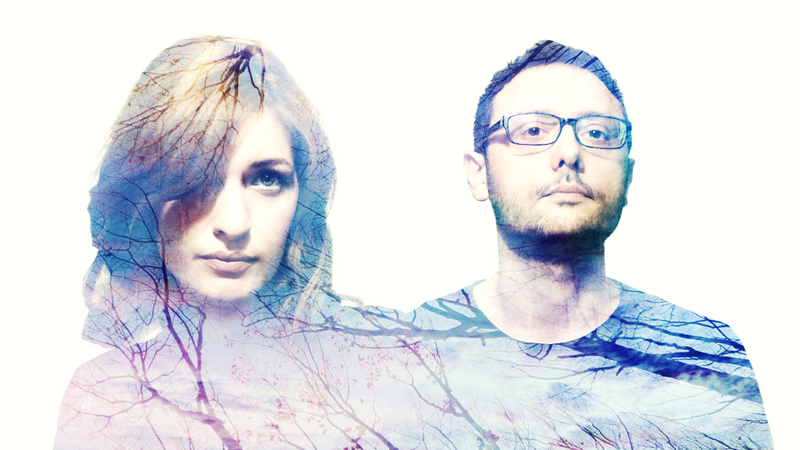 They’ve been on my radar ever since the first ArcTanGent festival and they’re a band I’ve wanted to book ever since. 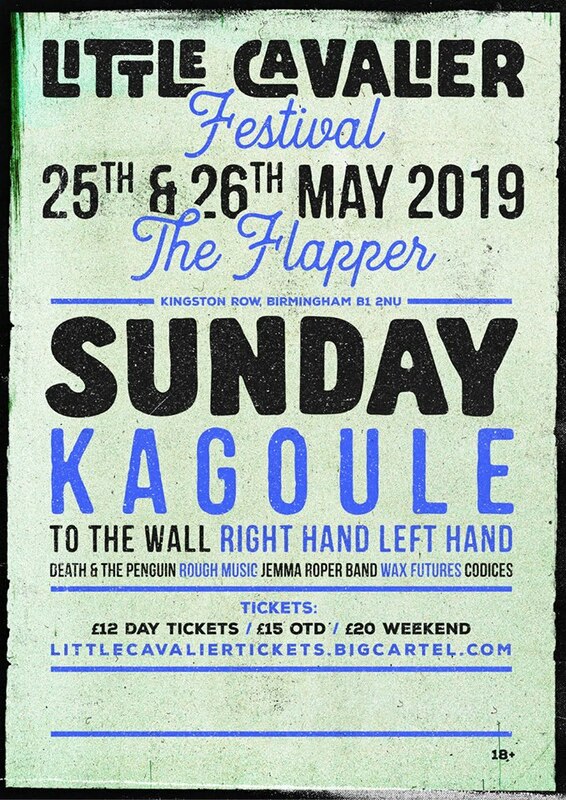 We really wanted to get Kagoule on last years event but due to scheduling clashes we couldn’t make it happen so to have them on this year is great. If I had my way I’d be booking a 7 day 24 hour festival just so I can book everyone! ● How do we get tickets? You can get tickets from LittleCavalierTickets.bigcartel.com. Day tickets are £12 and 2 Day tickets are £20. ● Is there a band/act you personally just can’t wait to see perform live? I’m really looking forward to seeing Too Piste again, they played last year and have come on leaps and bounds, their self titled debut EP is a filthy bass monster. I’m also really looking forward to Right Hand Left Hand on the Sunday. I had the pleasure of helping Bernie and Rhodri out at ArcTanGent in 2017 and they are phenomenal live! ● What do you love most about booking acts and promoting not only the festival but your own live nights too? I just love being the catalyst for making these things happen. The stress and the anxiety involved is all totally worth it when I see where people travel from to come to one of my shows, it really gives makes everything worthwhile. I do have to give the majority of the credit to the bands who agree to play and give up their time, they’re the real heroes, I just send emails! Haha! ● If you could describe Little Cavalier Bank Holiday Festival in just ONE word to entice more to support the event, what would be that word. ● How did you find the reception to the artists booked and your first ever festival last year? They were all really really happy to be on board! It was a long slog to get everything sorted I’m not going to lie, but totally worth it when we had the de-brief. The reaction from the bands (Apart from the parking ticket fiasco. Bloody Birmingham City Council) was incredible, I couldn’t have asked for a nicer group of people to have worked with! ● Since the line up announcement mid January how have you found the reception to the line up so far this year? It’s been incredible, so much positive energy! Can’t wait until May now! ● Is there anything new this year that you are excited to promote/ or anything that makes 2019 the best year yet? I can’t give too much away because it’s in its early stages but we’re working with an up and coming Brewery on something super special. It’s a secret though! ● Give us some LC festival advice- what one thing would you urge everyone to bring with hem over the course of the 2 day event? Enough cash to buy all of the merchandise from every band! And bring your dancing shoes! ● Tell us what this event means to you. Little Cavalier Festival is an accumulation of lots of hard work and determination, I’m very very proud of my position and to have people who trust me to organise things like this and to all the fans who turn up to our shows. Let’s hope to many more years! ● Are plans for 2020 weekend already underway and if bands or any helpers wanted to get involved whats the best way to go about contacting Little Cavalier? check out this website and do what you can to help grassroots venues! ● Finally, any last words? Just to say thanks to everyone over the years for supporting what we do at Little Cavalier! We couldn’t do what we do without the support of the fans and the bands. I LOVE YOU!